A guest post by my sister-in-law Jaclyn. And no, I’m not talking about the dreaded pre-requisite for all you commerce kids. If you’re like me you are constantly looking for new ways to store and display your ever-growing jewelry collection. After one too many trips to Forever 21, and one too many days cruising European street markets, I have accrued more than one bedroom can handle. I decided it was time for an organization overhaul. After all, my travel treasures deserve to be flaunted. Isn’t that what all the bargaining was for? 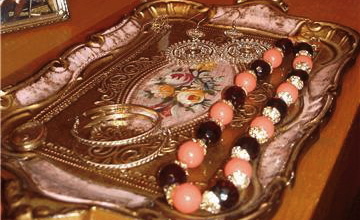 These hand-painted wooden trays are from Florence and serve up everyday jewelry. Ok so the necklace isn’t so “everyday,” but it was designed by Elizabeth Taylor’s personal jeweler. Hiding it would be a style sin. Most jewelry stores will sell you their display stands. This one is from Loulou Luv on Broadway, and I noticed some great ones at Front and Company on Main St. last weekend. I found this coat hook in a sale bin at Urban Outfitters. 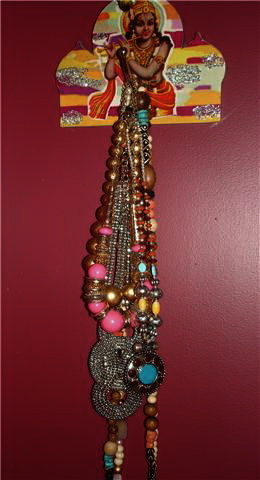 It’s turned into a “statement necklace” hook and I like the Indian vibe. Coat hooks are great ways to turn a tiny wall space into dazzling displays. This floral cake stand left me with such feverish glee, my mom thought I was insane. What a flirty and fresh way to stack your jewels. The best part is, if I ever decide to unleash my Martha, I can just switch up the pearls and rhinestones for cupcakes and tarts. For now I think I’ll stick with the jewelry. Such an easy way to cut calories. Want to write a guest post? (Oh good!) Send me a note at theanthology@live.com. Thanks again Jac for getting me a real deal on this dress and for writing the post on being a to-orist. Loving the stand from Loulou Luv. Style isn’t just what the piece looks like when it’s on your neck, wrist, ears or fingers…a true fashionista shows the love when they are resting or hibernating. Thanks Jac….you have no idea how much easier you’ve made it now to sneak in and do a jewelry raid of your room. Only problem is, you’ll now notice exactly what’s missing! 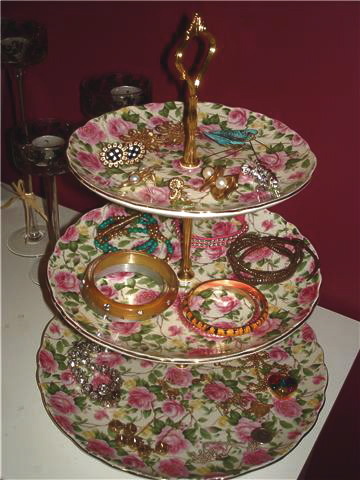 I love the idea of using a cake stand as a jewellery stand! So creative. OMG! What exquisite jewelry, the necklace designed by Elizabeth Taylor’s personal jeweler is breathtaking ! When it comes to Style you are ingenious, I picture your displays on the pages of Elle Decor or some other fab magazine! p.s. Those trays are just gorgeous – Thanks for the Beautiful sneak peak !!! 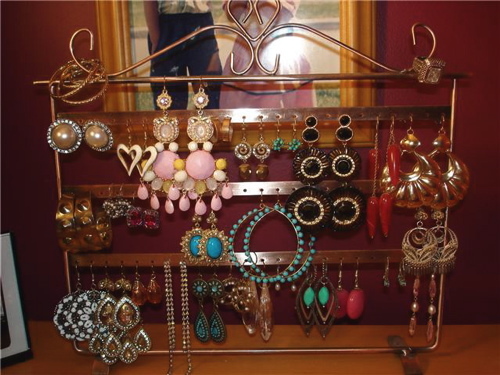 Such great eye candy and jewelry storage ideas in this post! You know what I saw that made me think of this post? One of those small Eiffel Tower figurines that was used to store a stack of rings. So cute! 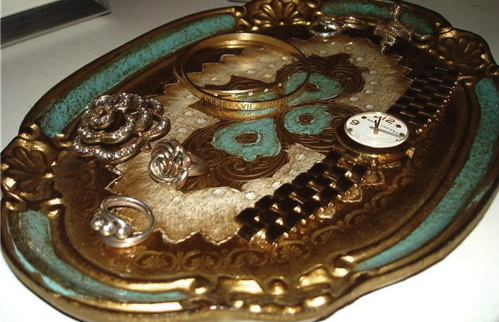 All your jewelry… the trays… oh my goodness. So fantastic. Was that really designed by Elizabeth Taylor’s personal jeweler? Holy cow! How much is that worth?